Are you in a hurry for your ice cream? 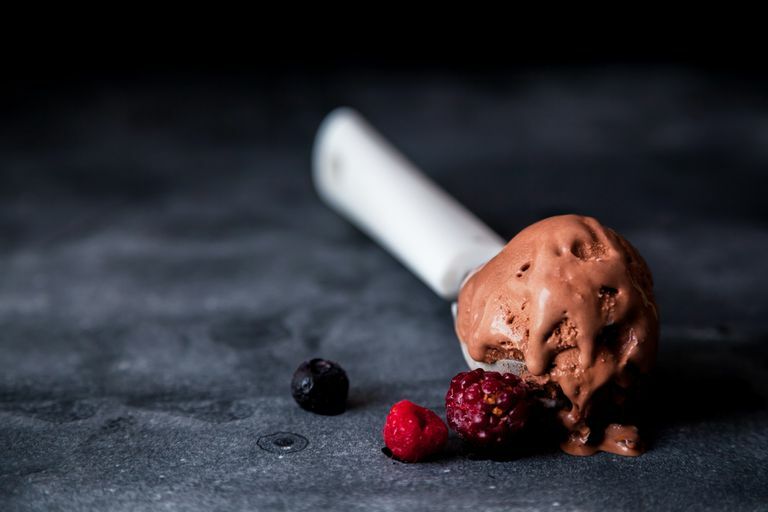 Try this quick and easy ice cream recipe using dry ice. The ice cream comes out carbonated, so it's very interesting. Avoid touching the dry ice. It's cold enough to give you frostbite. Test the ice cream before eating it to make sure it's not too cold. If the ice cream is soft, it's fine to eat. If it freezes very hard, let it warm slightly before digging in. First, you need to crush the dry ice. Do this by placing your dry ice in a paper bag and either smash it with a mallet or hammer or roll over the bag using a rolling pin. Mix all of the other ingredients in a large mixing bowl. If you want chocolate ice cream instead of vanilla ice cream, add 1 cup of chocolate syrup. Shake the dry ice into the ice cream, a little at a time, mixing between additions. As you add more dry ice, it will start to harden and will get more difficult to mix. Continue adding dry ice until the ice cream has reached the desired consistency. Feel free to stir in flavorings or candy pieces. The ice cream may be very cold! Use care when eating it to avoid frostbite. If the ice cream is soft enough to stir or scoop it should be warm enough to eat safely. You can then freeze leftover ice cream to eat later. Do you prefer chocolate? Here's a simple recipe to try with no eggs or requirement for melting chocolate. It's easy! Whip the heavy cream to form stiff peaks. In a separate bowl, mix together the sweetened condensed milk, cocoa powder, salt, and vanilla. Fold some of the heavy cream into the condensed milk mixture. Fold in the rest of the whipped cream to get a uniform ice cream. Add the rest of the dry ice, bit by bit, until it freezes. Eat the ice cream immediately to enjoy the bubbly texture. You can freeze leftovers. Dry ice is colder than a home freezer, so it does a good job of freezing ice cream. Dry ice is solid carbon dioxide that undergoes sublimation to change from solid form into carbon dioxide gas. Some of the carbon dioxide bubbles get trapped in the ice cream. Some of it reacts with the other ingredients. The carbonated ice cream has a slightly tangy flavor, much like that of soda water. Because the flavor is different, you might prefer flavored ice cream over plain vanilla.